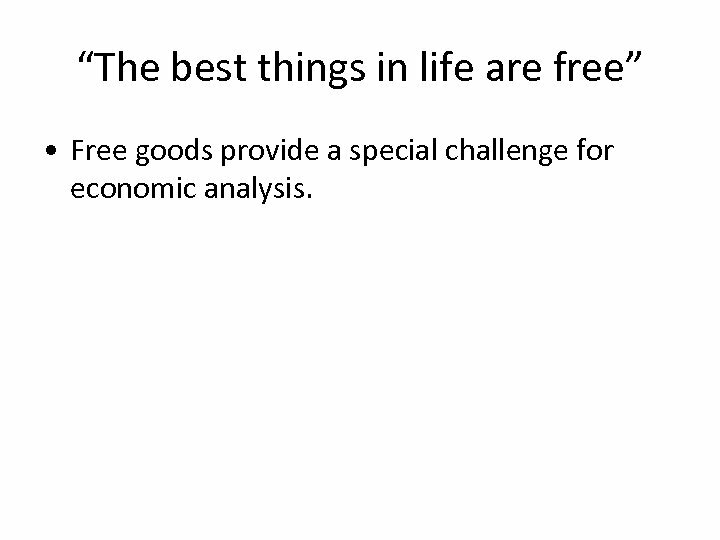 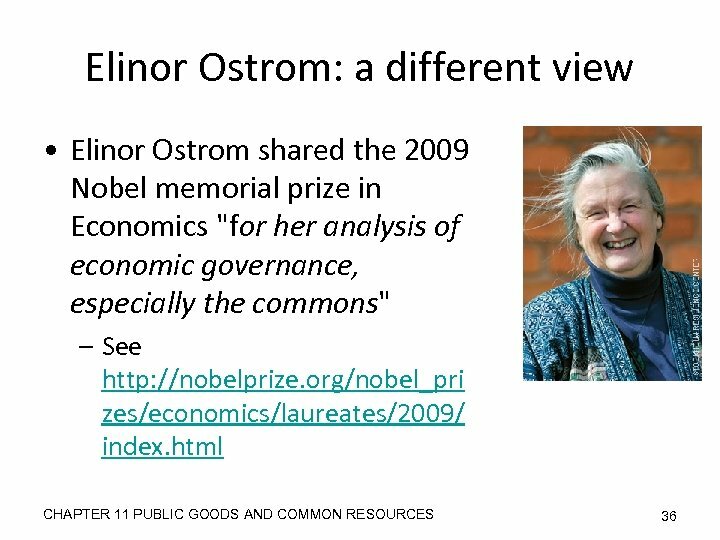 “The best things in life are free” • Free goods provide a special challenge for economic analysis. 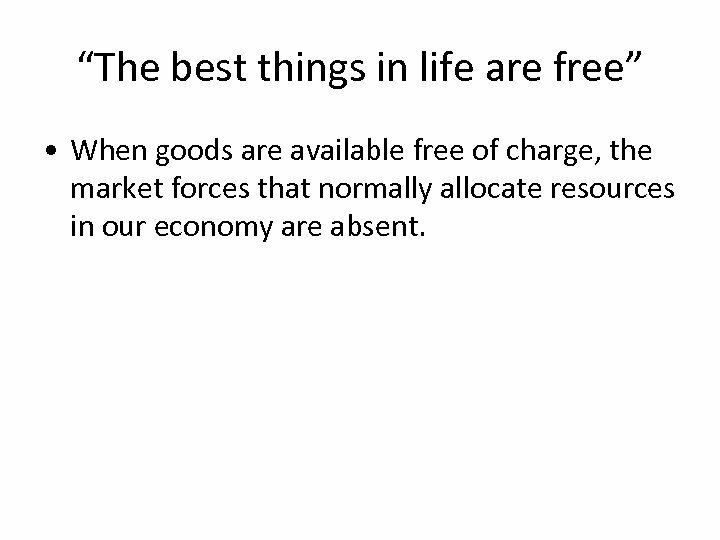 “The best things in life are free” • When goods are available free of charge, the market forces that normally allocate resources in our economy are absent. 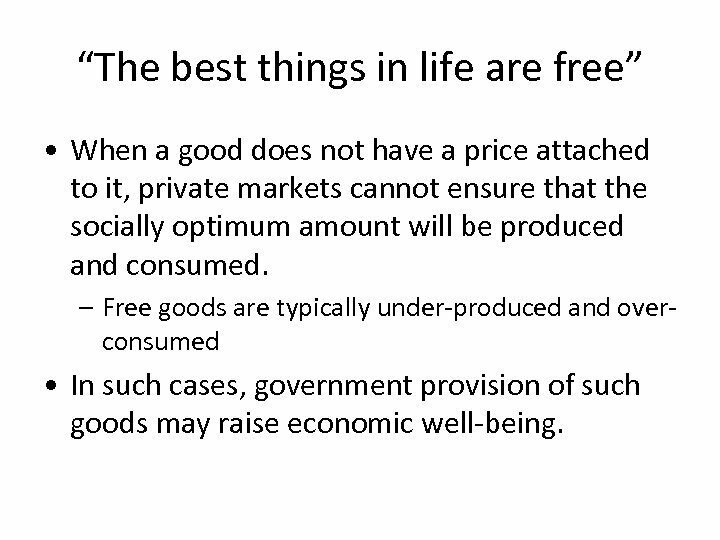 “The best things in life are free” • When a good does not have a price attached to it, private markets cannot ensure that the socially optimum amount will be produced and consumed. 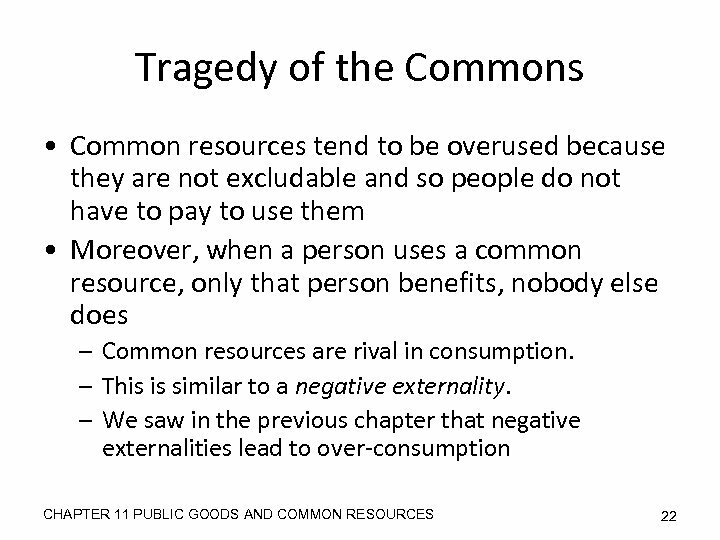 – Free goods are typically under-produced and overconsumed • In such cases, government provision of such goods may raise economic well-being. 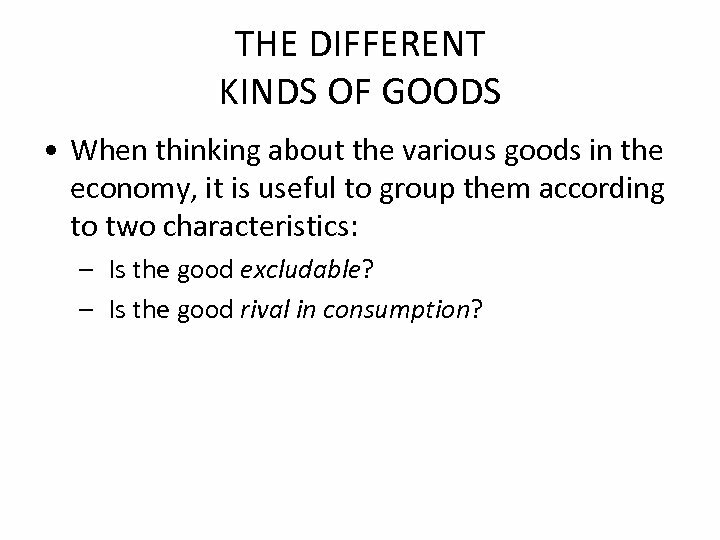 THE DIFFERENT KINDS OF GOODS • When thinking about the various goods in the economy, it is useful to group them according to two characteristics: – Is the good excludable? 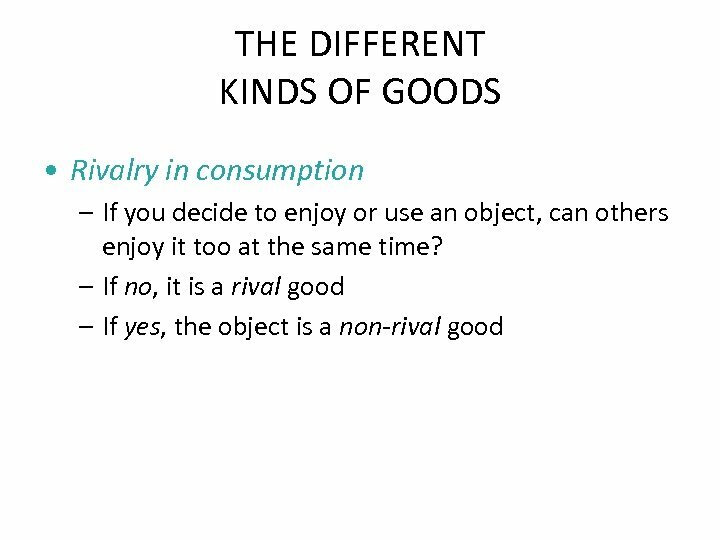 – Is the good rival in consumption? 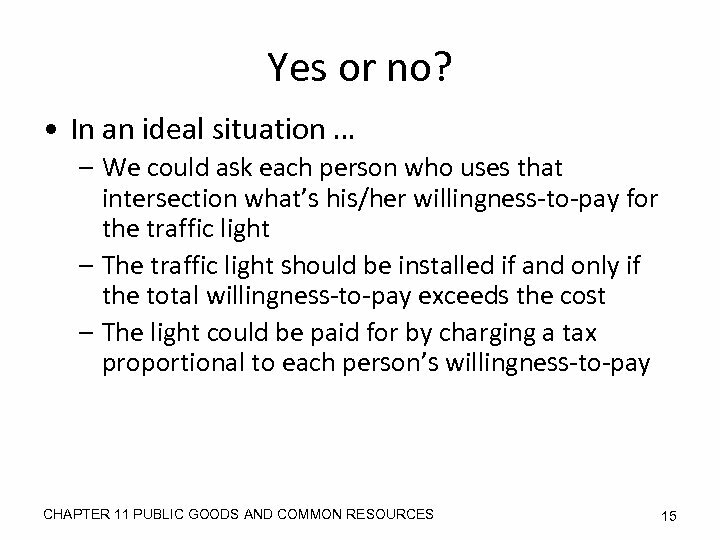 Public Goods: The Free-Rider Problem • Since people cannot be excluded from enjoying the benefits of a public good, they may refuse to pay, hoping that others will. 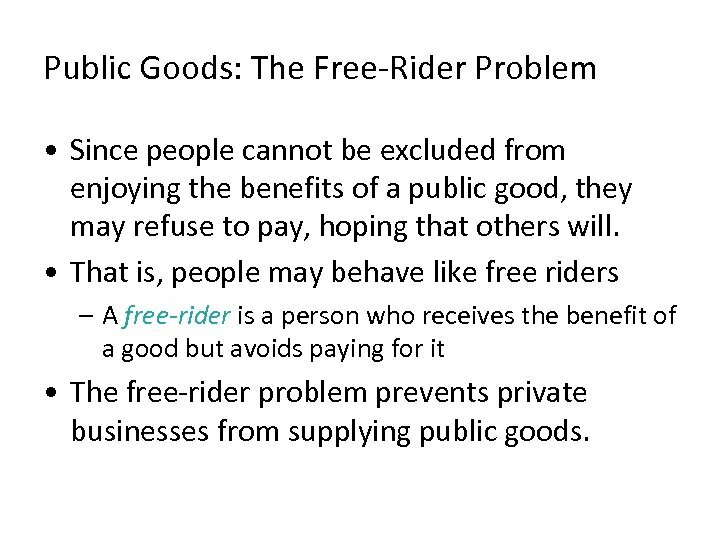 • That is, people may behave like free riders – A free-rider is a person who receives the benefit of a good but avoids paying for it • The free-rider problem prevents private businesses from supplying public goods. 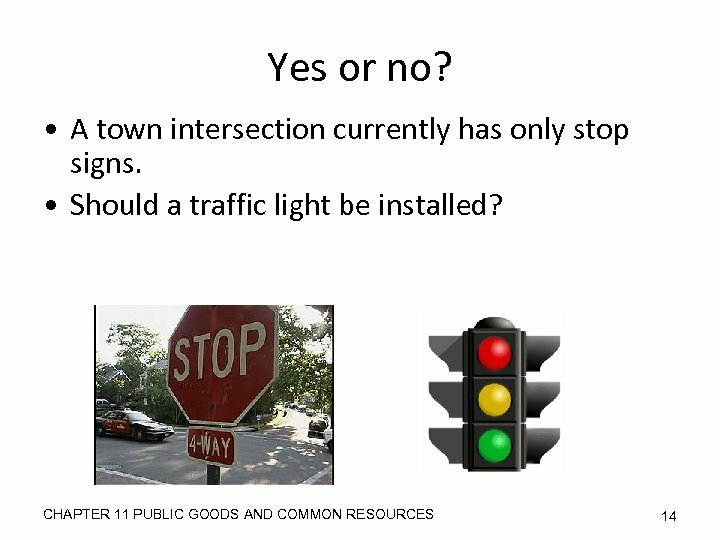 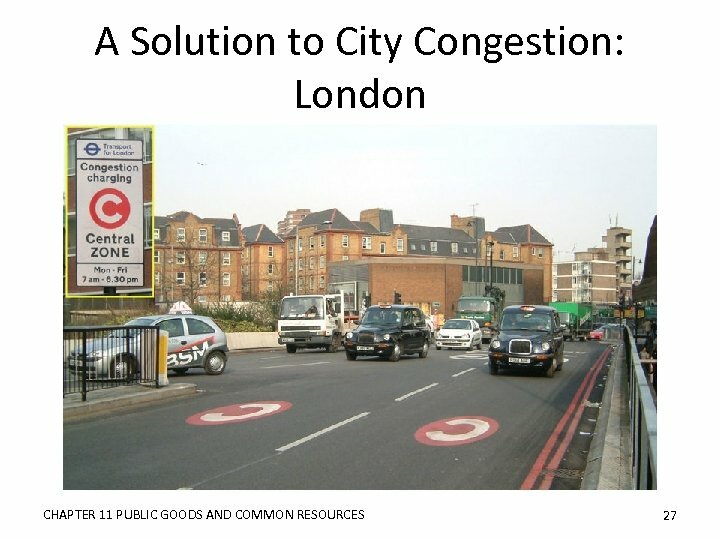 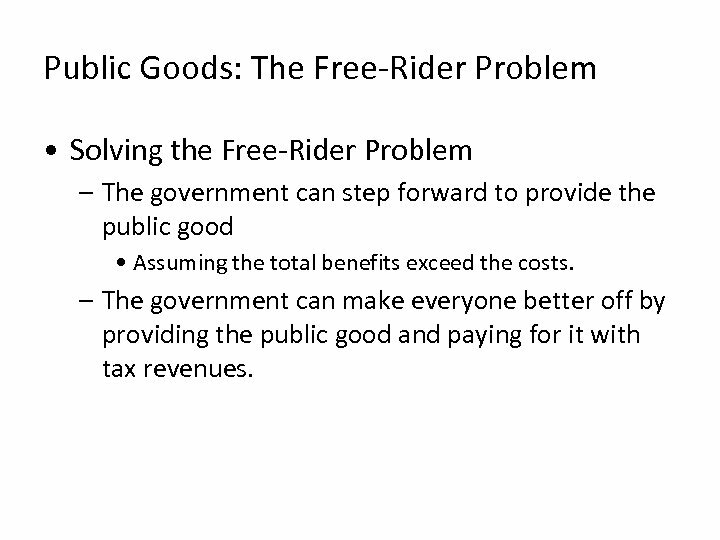 Public Goods: The Free-Rider Problem • Solving the Free-Rider Problem – The government can step forward to provide the public good • Assuming the total benefits exceed the costs. 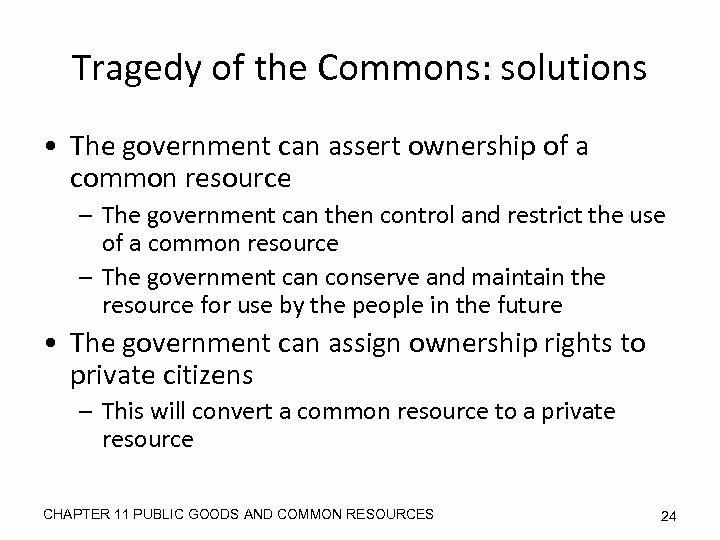 – The government can make everyone better off by providing the public good and paying for it with tax revenues. 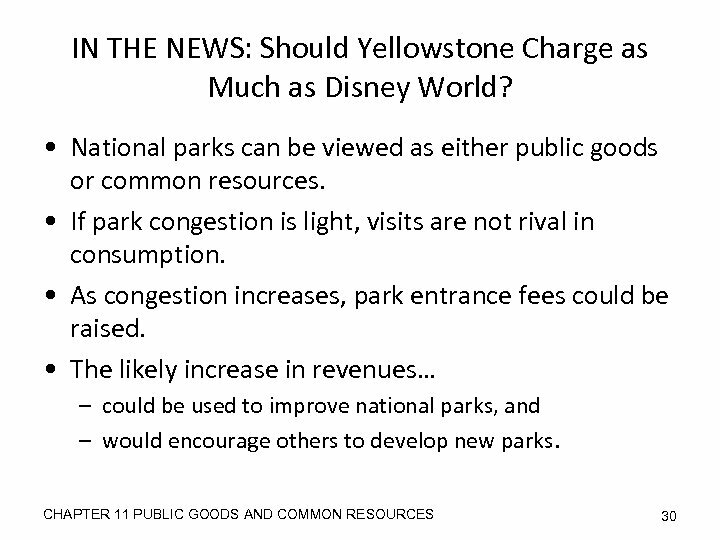 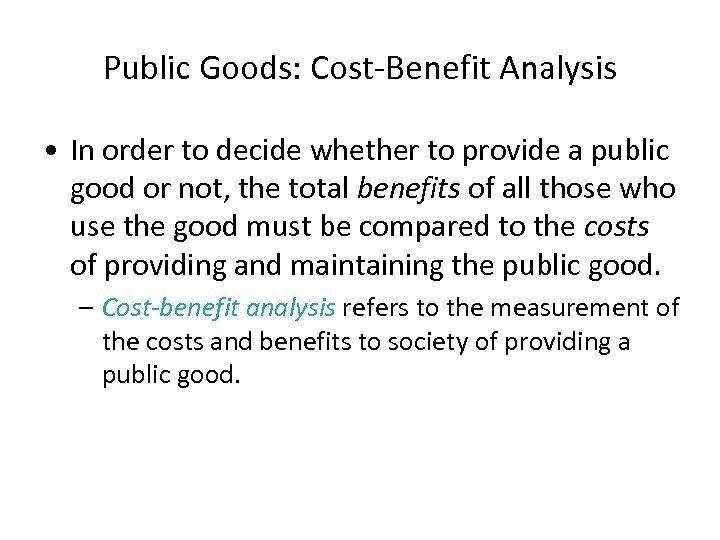 Public Goods: Cost-Benefit Analysis • In order to decide whether to provide a public good or not, the total benefits of all those who use the good must be compared to the costs of providing and maintaining the public good. 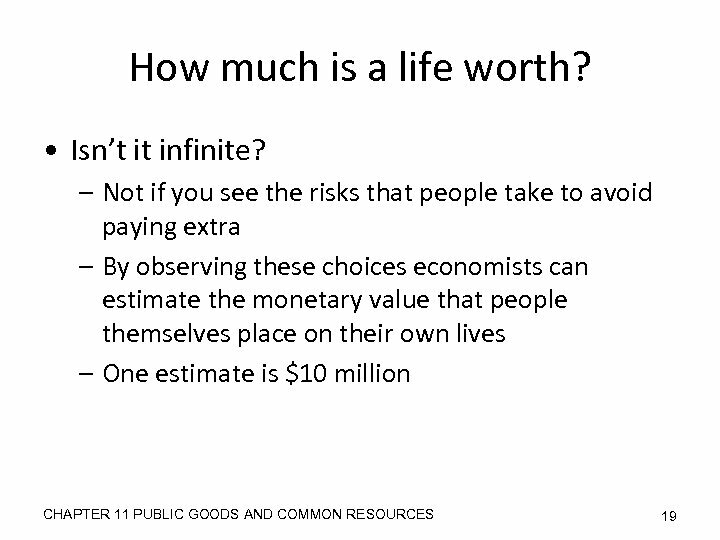 – Cost-benefit analysis refers to the measurement of the costs and benefits to society of providing a public good. 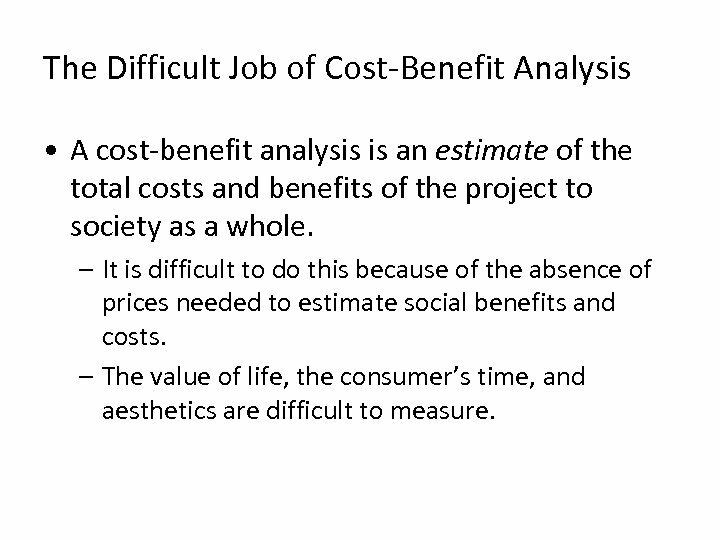 The Difficult Job of Cost-Benefit Analysis • A cost-benefit analysis is an estimate of the total costs and benefits of the project to society as a whole. 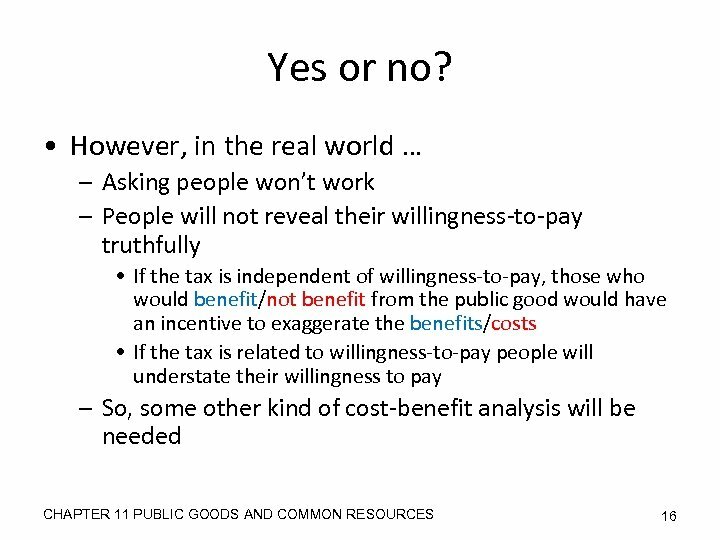 – It is difficult to do this because of the absence of prices needed to estimate social benefits and costs. 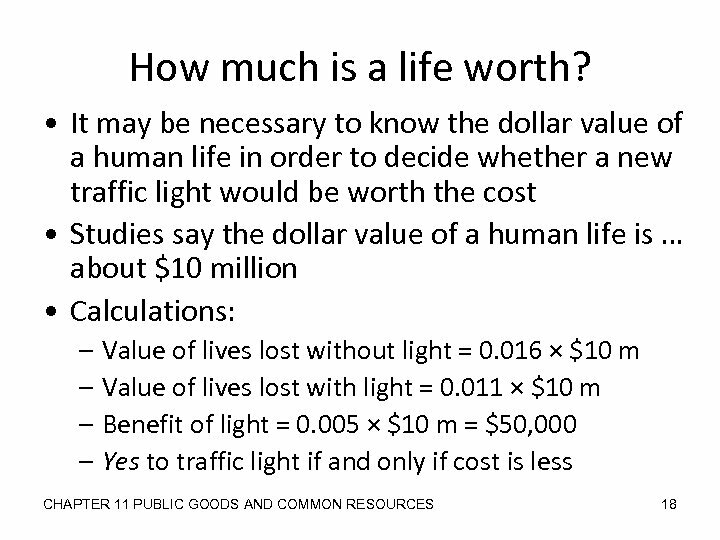 – The value of life, the consumer’s time, and aesthetics are difficult to measure. 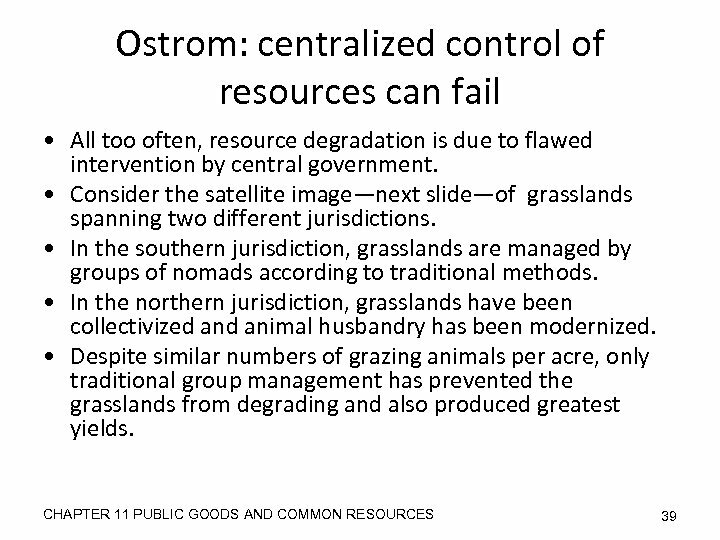 CASE STUDY: Why Isn’t the Cow Extinct? 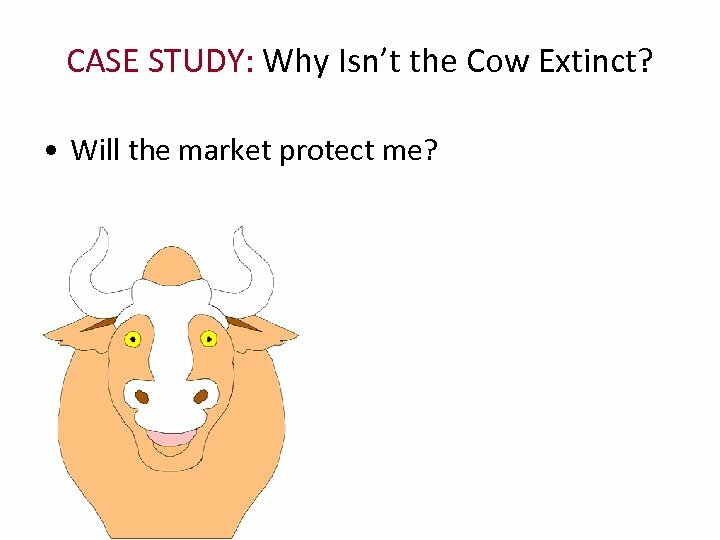 • Will the market protect me? 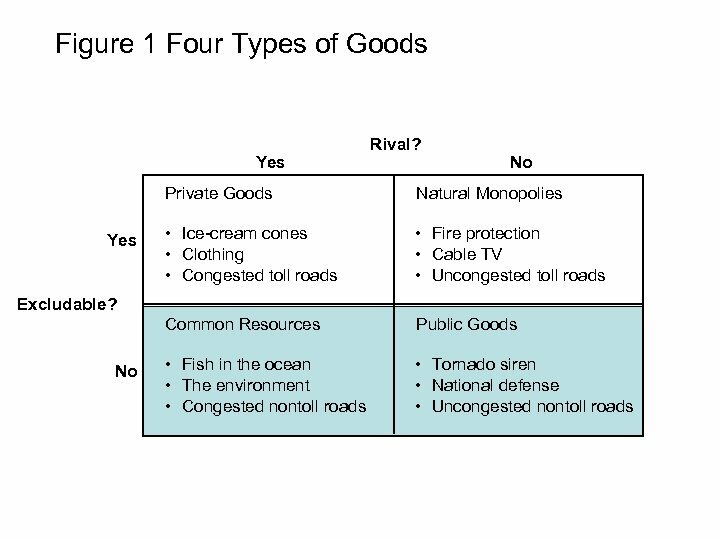 Summary • Goods differ in whether they are excludable and whether they are rival. 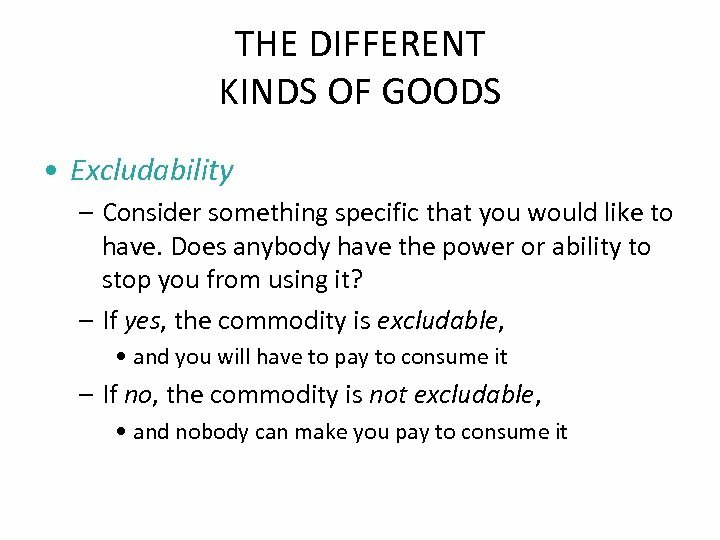 – A good is excludable if it is possible to prevent someone from using it. 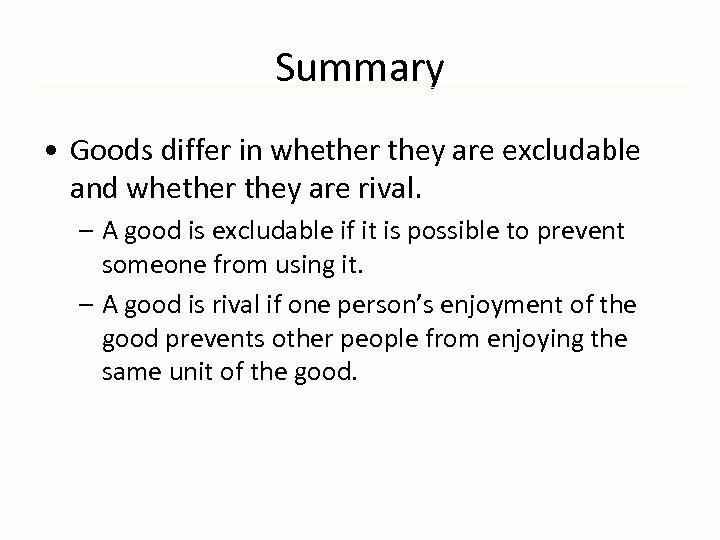 – A good is rival if one person’s enjoyment of the good prevents other people from enjoying the same unit of the good. 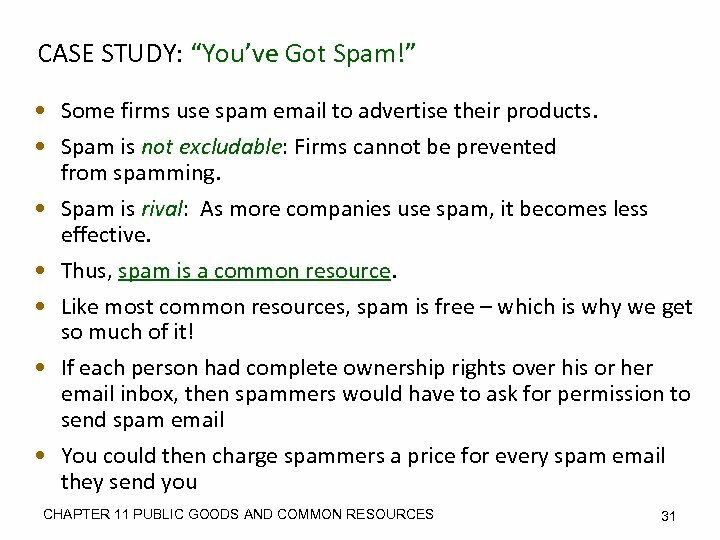 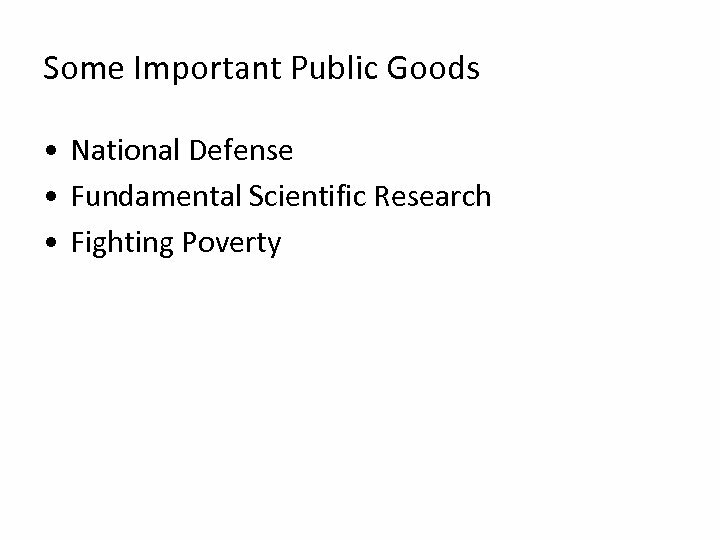 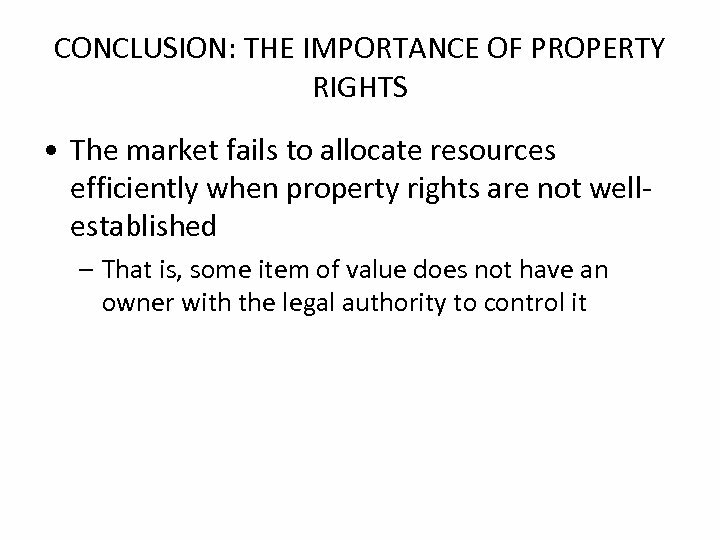 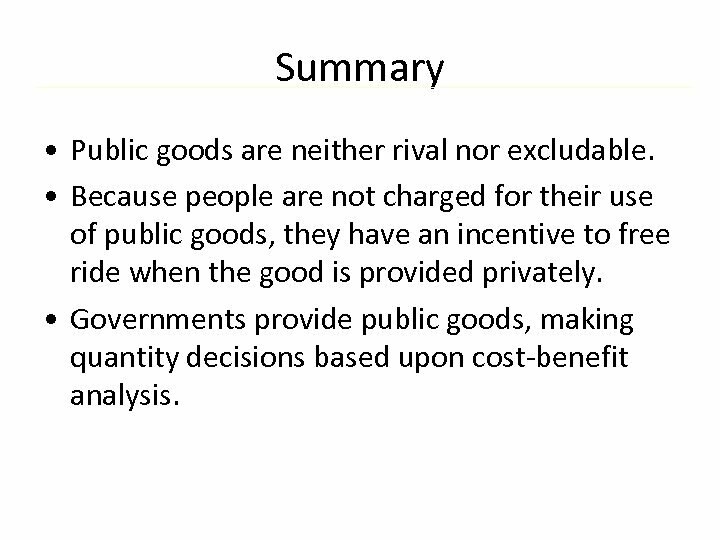 Summary • Public goods are neither rival nor excludable. 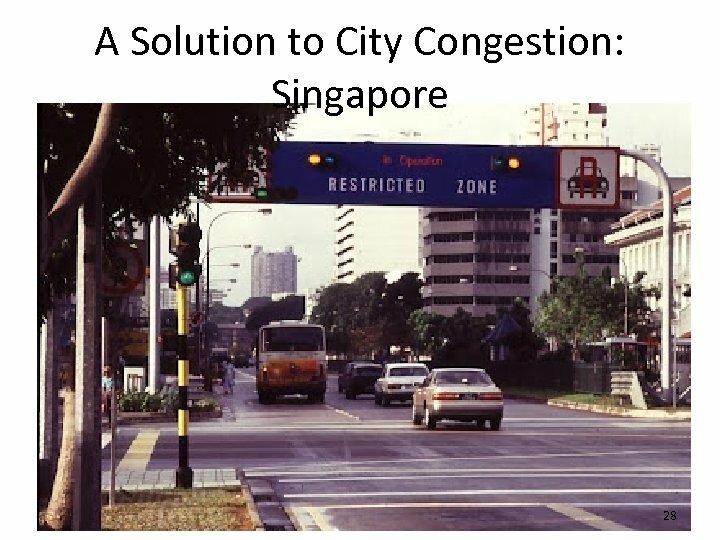 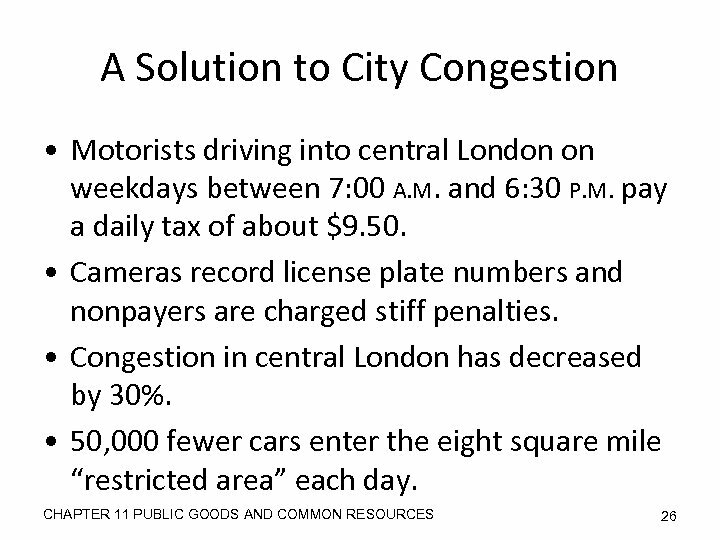 • Because people are not charged for their use of public goods, they have an incentive to free ride when the good is provided privately. 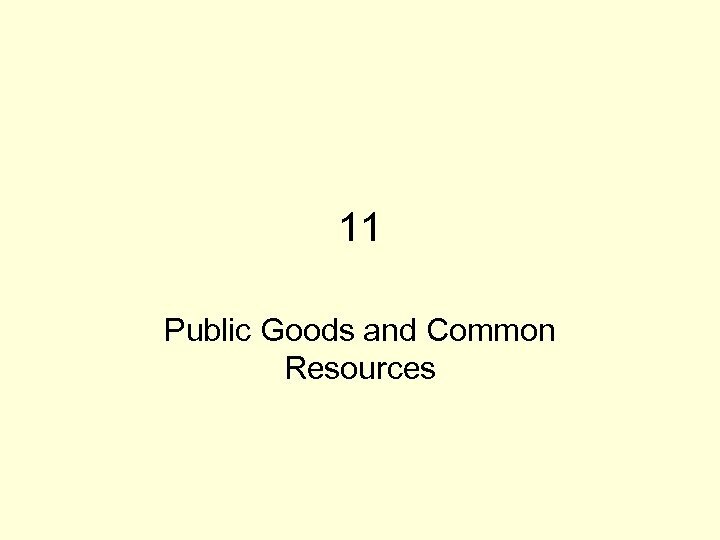 • Governments provide public goods, making quantity decisions based upon cost-benefit analysis. 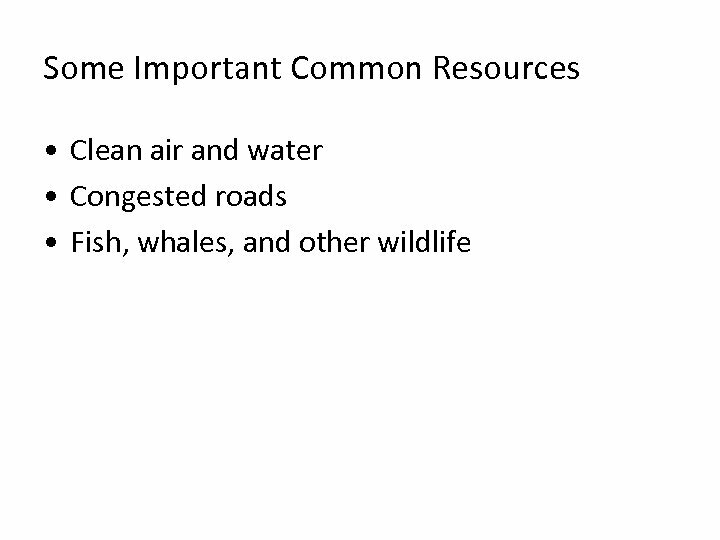 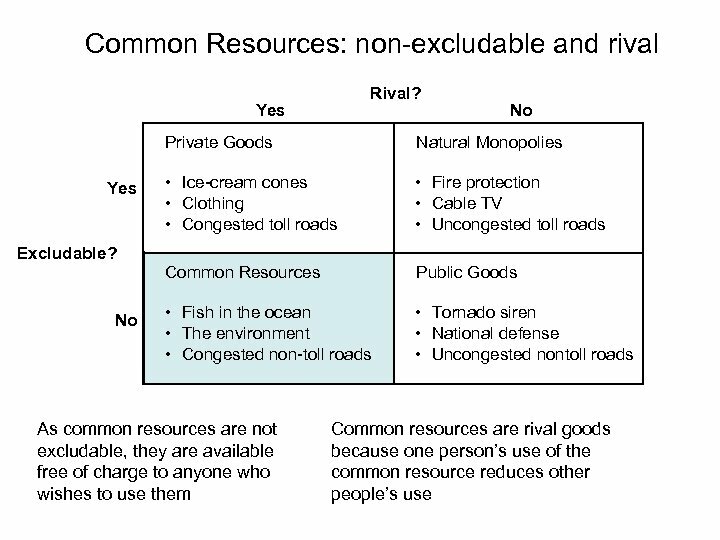 Summary • Common resources are rival but not excludable. 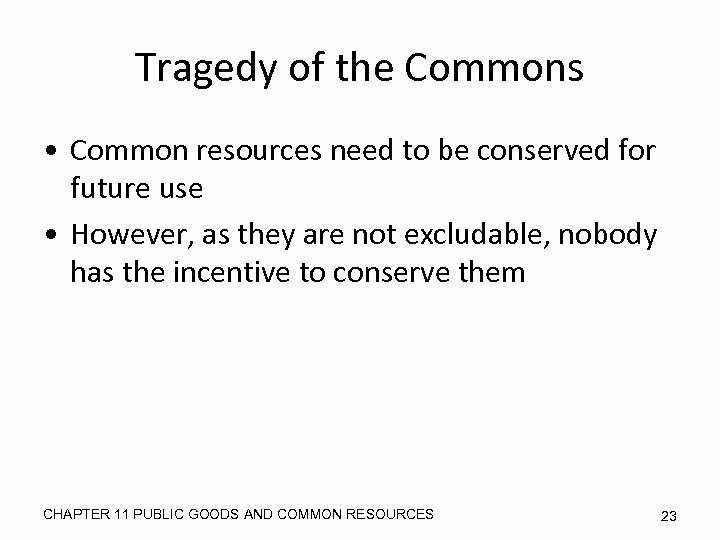 • Because people are not charged for their use of common resources, they tend to use them excessively. 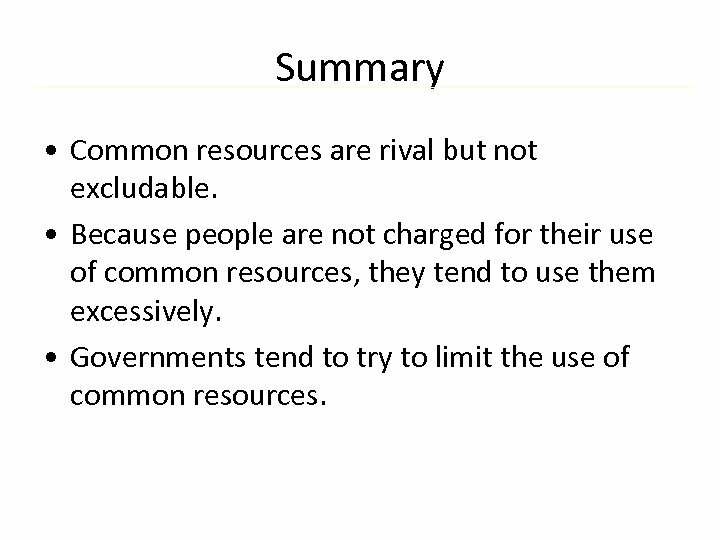 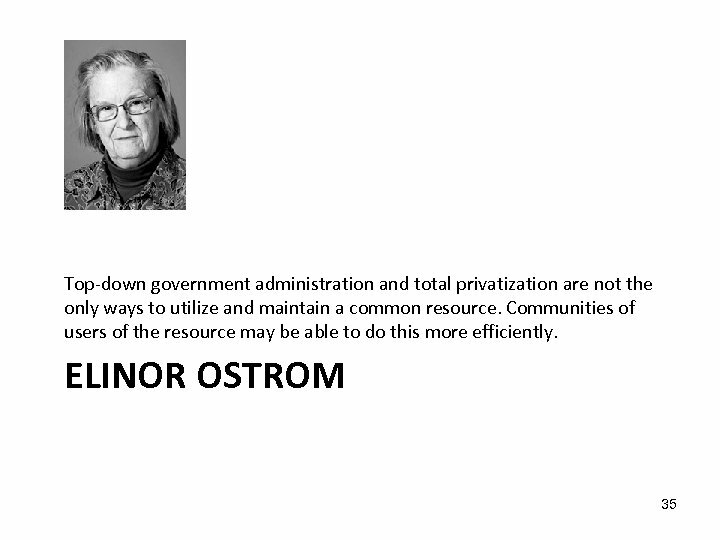 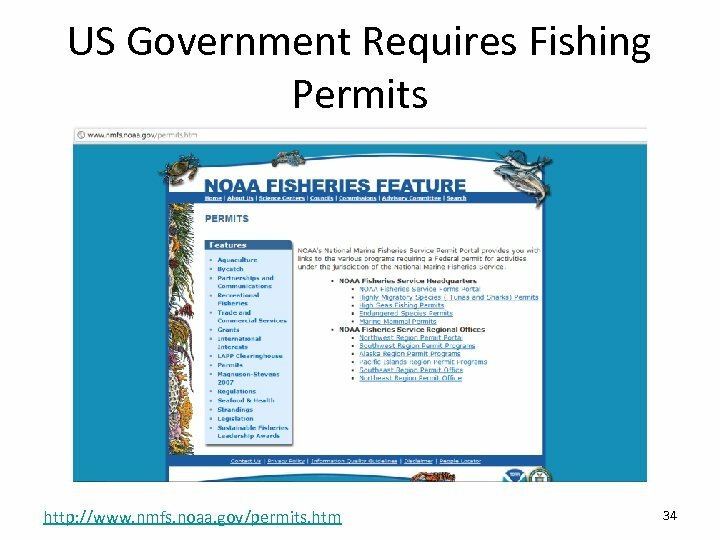 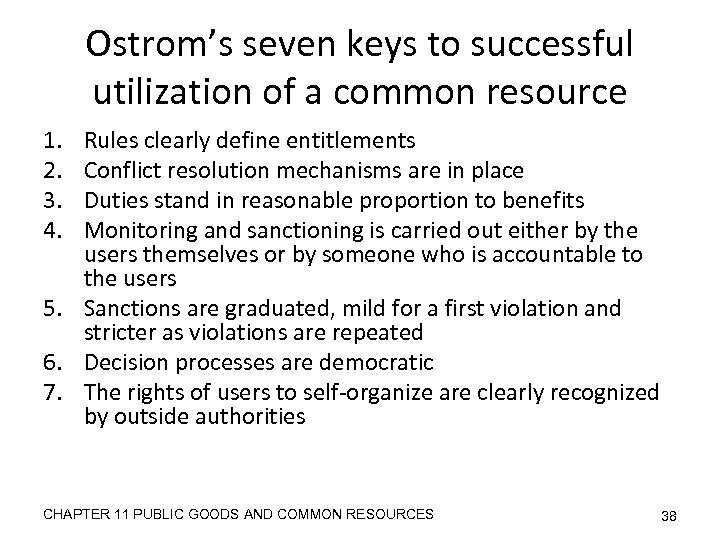 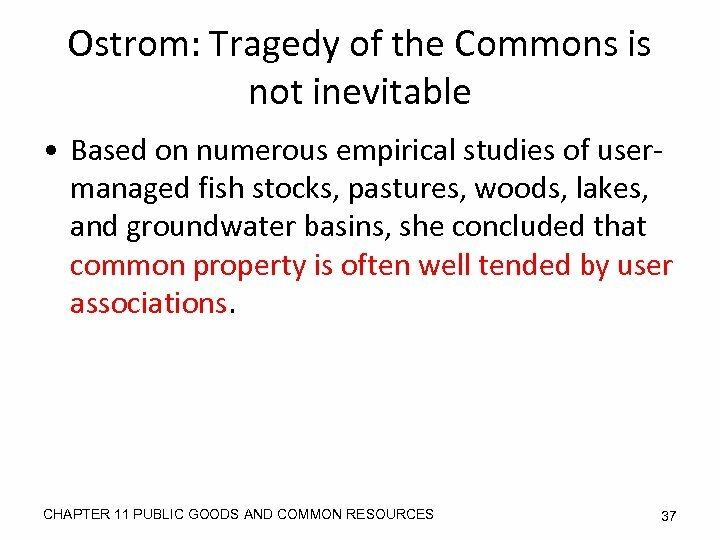 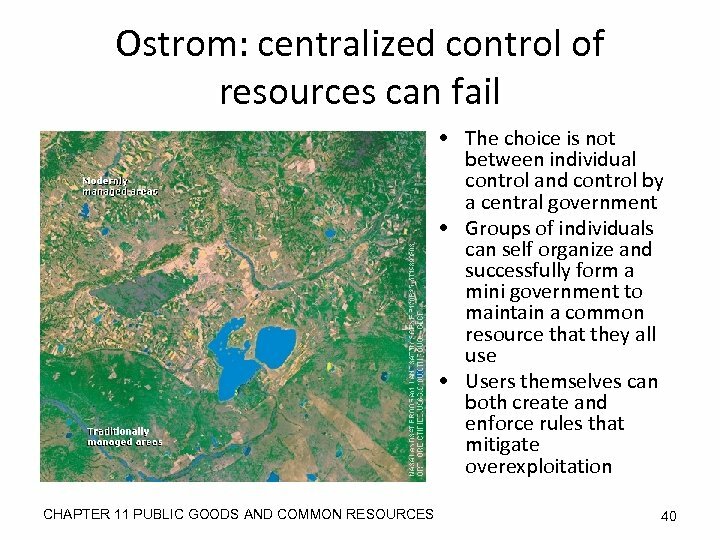 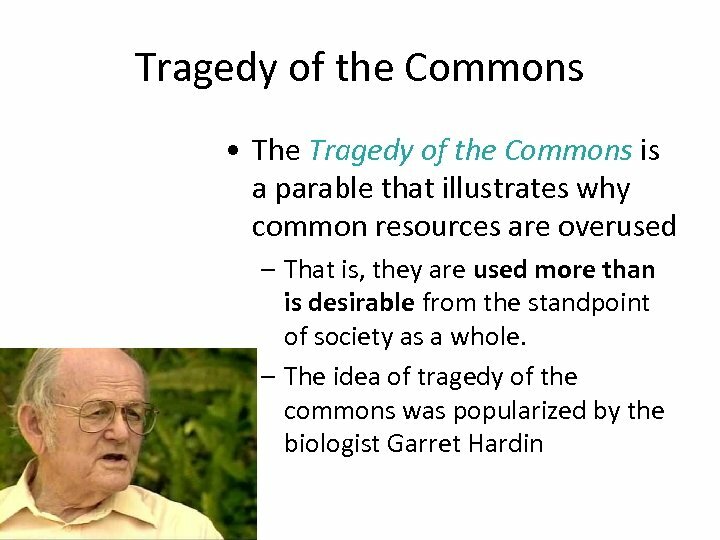 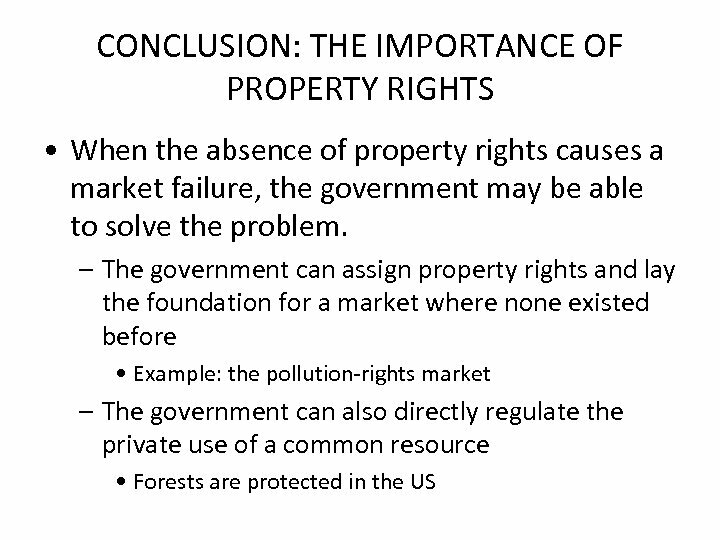 • Governments tend to try to limit the use of common resources.